Have you ever come across a band that was universally liked? Maybe you thought you were the only person in the world that jammed to a certain song, but then you find out everyone you know feels the exact same way. I think that’s the case with today’s featured band. They’re maybe not a band everyone talks (or talked) about, but when you hear one of their hits come on the radio, the world seems to stop and everyone starts to sing along. 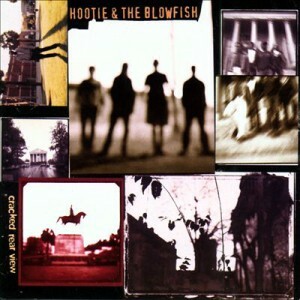 Hootie and the Blowfish were formed in 1986. The four guys met as freshmen at the University of South Carolina in Columbia, S.C. Guitarist Mark Bryan heard a guy singing in the communal dorm showers and was very impressed by the vocal ability. I’m not sure how he approached this man in the shower, but it turned out to be Darius Rucker, and the band was born. Since Darius is the lead, many people assume he’s Hootie–but in reality the name is derived from two college friends. One was nicknamed Hootie, the other Blowfish. Success for the band came right away. Their debut record was Cracked Rear View, which to date has sold almost 30 million copies worldwide. It was not only the best-selling album of 1995, but it is also listed as one of the quickest-selling debut albums in U.S. history. On the surface, it doesn’t completely add up. When you put this on, that sort of sales record and instant success, the album has to be something astounding or totally innovative, right? It really isn’t. But what you hear is probably one of the most solid albums of the decade—it’s nothing you haven’t heard before, but it’s put together in a way that is 100% quality. When they recorded the album, they delivered the goods on every single track. And that isn’t easy to do. This is going to fall in the rock genre of music–but that’s really not quite it. It’s definitely “poppy,” and I think that’s what spurred so much of the early success. But it also has this roots rock type feel, and by that I mean you get this mash up of folk, blues and a little country all combined into one. You could also hear it described as southern rock, which this isn’t Skynyrd, but the description makes sense. There is something entrancing about Rucker’s vocals, and between that and the jam nature of some of the record, it’s just a great listen. His vocals are really highlighted on a ballad track like ‘Let Her Cry’, which is probably my favorite on the album. For a little personal story, I had rented a large luxury SUV for my wedding a few years back. I had a stack of CDs in the car to play and my friend sitting shotgun decided he’d poke fun at me by putting this album on. His initial reaction was certainly a look of, “Why is THIS in your CD case?” Fast forward a couple tracks and the entire car of five guys was singing along, word by word. A prime case of how many people this album reached, as we certainly aren’t the main demographic for the Blowfish. Relive the mid-90s today with Hootie. I can promise you it’s as good as you remember, and you will find yourself singing along with the first half of the album. Completely worth $5 bucks, and it’ll help break your Tuesday blues. I love Hootie and the Blowfish. However, lead singer Darius Rucker (Hootie) is now a huge country singer and doing very, very well! He’s made a great transition. I’ve seen him in concert and he tends to do Hootie and the Blowfish songs in his encore and has the other singers who are on tour with him, join in. Very fun! Yes, I was going to put something in the post about Darius’s transition – but thought this was more of a HATB post. If he has a country album out there for $5 bucks soon, I’d be happy to review it! Thanks for the comment Rhonda!